Or maybe save all the food today. It's harvest season, which means that we are in the kitchen most of the time. This year I'm actually canning, whereas last year I only did a little because I had been so sick. And the year before I did nearly none, since we were moving in. That's an interesting transition, and it tells me that this year is better than the past two have been. Sometimes it's hard to see gradual improvement. I did a few dozen quarts of applesauce, and wrecked my right pointer finger doing all the cutting. The apples were on the green side, so they were a bit tougher to cut through. The applesauce is still good though, even if it is more tart. I can't tell you how excited I was when I sent the twins outside with their big white bowls to get more apples - and they came back empty. No more apples! 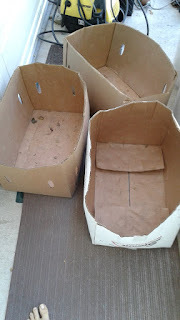 These boxes were full to overflowing - and we haven't even started on the apples from our own trees! They won't be ripe for a few more weeks. I'm always amazed at the wonders of our beautiful world when I'm canning. 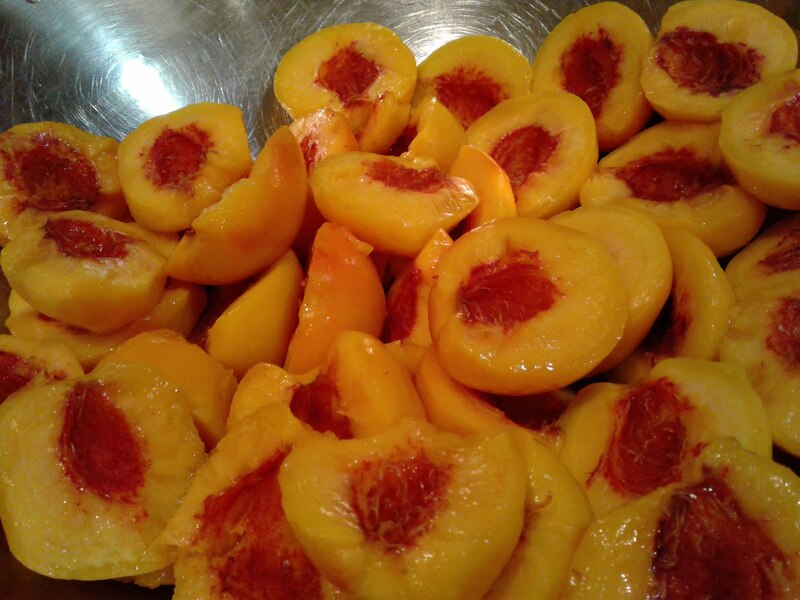 Aren't these peaches gorgeous? The colors are vibrant and living, sustaining and improving our lives. Thanks, Lord, for this amazing planet! I love, love, love bottled peaches. And I hate peeling peaches. 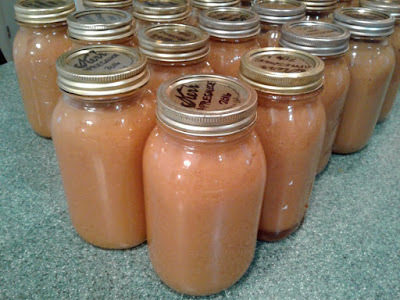 Fortunately for me, my sweet husband doesn't mind, so he peeled and I made jam - rows and rows of bottles full of it. I was poking about in the storage room for a good shelf to load all the bottles onto. We haven't really cleaned out the storage room since we moved in, and it isn't really set up efficiently. I moved a couple of cans, and the whole shelf fell out! I'm glad I didn't have it full of glass jars. So we need to fix and shore up the shelves in the storage room, but the produce won't quit coming! I moved things around as best I could, and made room for the peach jam with the apricot jam we did earlier this summer. Before Trent could start shelf-fixing, the grapes ripened, and we've spent the past week doing what must be a million batches of grape juice. I'm generous to myself here, because Trent has done all the work on this one. The kids love the juice, and I try to not imagine it spilled on... on anything. Our excitement of next week: tomatoes! The pears are on right now as well, and then our apples will be last. At least, I think they will be last. I opened a new bottle full of apple butter from a couple of years ago, and spread some of its dark sweetness onto a hot piece of whole wheat toast. Yum. Having food in my pantries makes all the hard work worth it. And now I want another slice of toast! I guess it is the end of summer. Sigh. I love having my kids at home. I love not having to get up at any particular time. I especially love not having to get up early. Like before 9 or 10. I know, I grumble too much. But I am excited for this new year. I am so glad that my children have the opportunity to go to school and learn. I am looking forward to having a quiet house. I like having these changing seasons in life - it's never boring! To celebrate Labor Day (and to make up for not using our season passes, not once! 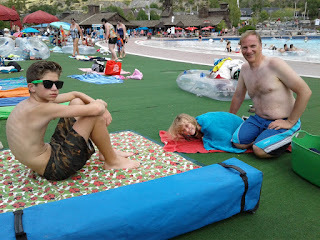 ), we went to the waterpark. It was to be a day filled with water slides and lazy rivers and wave pools and laying in the sun and trying to avoid sunburn. Unfortunately, the day was cloudy and unseasonably cool, which meant that only the most daring of the boys even wanted to get in the water. The wave pool was somewhat warm, but the breeze was uncomfortably cold. 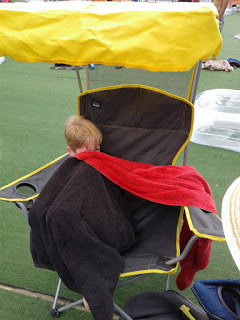 It didn't take long for the littlest ones to get chilled through, and want nothing more than to be swaddled in a big, dry towel. We even managed to visit with Ben, who has spent his summer with crazy-busy hours as a manager of the food areas. He looks good in his no-nonsense black non-slip shoes! I'm glad he got a good job for the summer and has been able to save up money for college. Yeah, we didn't last very long. 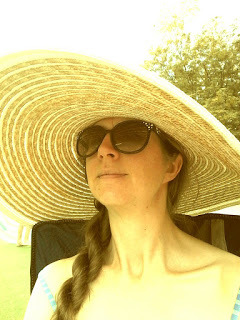 Hooray for not getting sunburned, though! 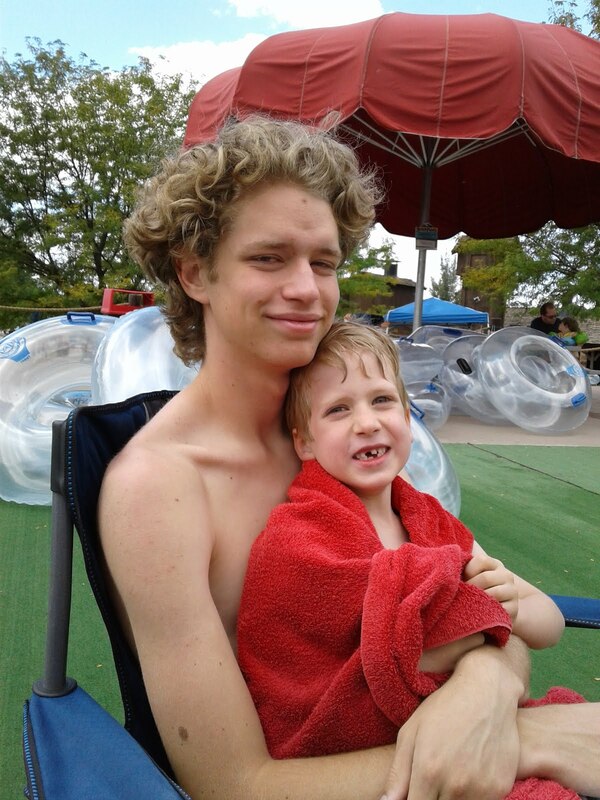 And now the kids can't say I never took them to the waterpark. It was just too much of a challenge to gather up the strength, all of them, and Opa. He didn't want to come today, so that made it possible for us to come. I was able to snap a picture of everyone but Ben, who was busy working, and David, who had a splendid time on the water slides in spite of the cold. He is our most adventurous one, after all. Sometimes I wonder if the effort to have a family outing is worth it, but I love to see the happy in their faces. We're making memories, at least!